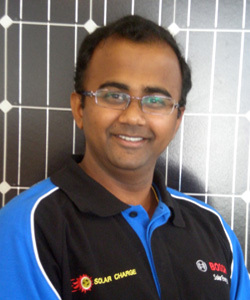 Raj Ranganathan – Managing Director After completing his Master’s Degree in Microelectronic Eng., Raj joined Solar Charge in 2006 as a Technical Sales Engineer. He has grown with the Company and is now the Managing Director. As Solar Charge constantly seeks to expand its product range in the wholesale market, Raj has been able to provide reliable and accurate information to the installer / dealer. From repairing wind turbines to quoting on major projects, Raj has can assist wholesale accounts either over phone or at site. His electronic / computer science background comes extremely handy when programming of Inverters (Eg: SPPRO), SMA Accessories (Sunny Webbox, Sunny Explorer) etc becomes necessary. Richard works as a consultant to Solar Charge in addition to training installers in the renewable field overseas. 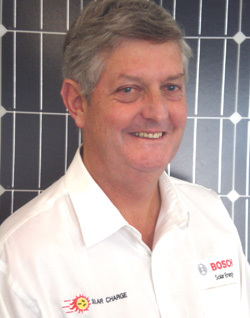 Initially a Senior Research Scientist at ARCO Solar in California USA and, since returning to Australia 30 years ago, Richard has been a leader in the development of Australian solar system design, installation and product development. Richard's dedication and commitment to Renewable Energy is further demonstrated by building one of the most energy efficient homes in Australia utilising solar electricity, solar hot water, energy efficient design and rainwater capture. This home has won four state and national awards of which Richard is proud. Richard lives and works in the field of his passion. 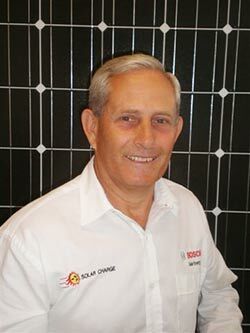 Peter Israel is a consultant to Solar Charge having been in the Australian solar electricity industry for over 15 years. Initially an industrial chemist with ICI Australia, Peter developed a general management career in both the manufacturing and service industries with companies such as Mayne Nickless and Southcorp. Peter has brought his all-round logistics and experience to ensure timely delivery of products and service. Peter enjoys working with the customers and being involved in building a vibrant solar electricity industry. Peter also lives with solar power and pioneered Grid Connect in the Mildura region. In addition to the strengths and experience of the employees, Solar Charge Melbourne has a strong electronics and practical background to assist in system design and the efficient and successful implementation of residential and commercial Grid Connect and Off Grid applications. Solar Charge Melbourne has a willing and knowledgeable support team with strong processes to deliver what we promise. Our 40 years industry experience with the technical and regulatory issues ensures ongoing up-to-date back-up of your system. We have a showroom, with much of the equipment on display, and where your questions can be answered. Solar Charge Melbourne seeks out and only offers quality products such as LG Solar panels, Selectronic and SMA inverters which have a proven reputation for reliability and durability. As Managing Director of Solar Charge Melbourne, Dr Richard Potter's expertise and career has always been in the Solar Electricity and Renewable Energy Industries. Design and implementation of residential and commercial Grid Connect and Off Grid applications. Solar power designers.